Pretty vintage prints of them that is. to mow my lawn that is. I just love all these photos with the antique cows. I might have to add a cow or two to my decor! image sources: cottage living, country living, and abundance secrets. 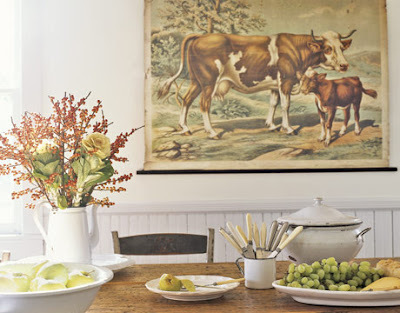 Love vintage cow prints and especially old paintings of cows and farm scenes. Your post on antique kilims was wonderful, too! I **heart** them too! This past summer I found a wonderfully rusty cast iron cow which I love! Of course I'm hoping to add a few more cows around the house! We bought our cow painting in North Georgia last summer when we were visiting....we love it! It's one of our favorite pieces!!! My husband actually just built a frame for it from salvaged wood from one of my parents' barns. Love them. I think they have their own sophisticated country charm. I'd love to see how you would integrate one (or 3) into your decor. I think that it is stuff like this that gives a home personality. I love the vintage pictures of cows!! I am married to a 3rd generation dairy farmer and so when we got married and started our home I found a few vintage prints of cows...they are some of my favorites!!!! Do it! They just speak farmhouse. Didn't one of the barnhouse vendors have a great cow piece of art displayed....I think I saw it on another blog. I was actually photographing some cows today at the farm store when I was getting hay for my horse. They were curiously watching us and when I got too close with the camera they spooked backwards and I freaked out and ran to the car, LOL! Love your blog and often read your favorite blogs. 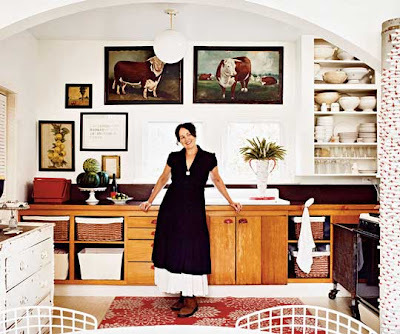 One of your blog picks- Curious Sofa has a great cow platter on thier online store (under the heading kitchen) check it out. Bought it for my daughter who is in Vet School and loves large animal medicine.Thought it was a fun thing for under the Christmas tree she would never guess. Great pictures! I love how they bring a little rusticness to a room! I am not a big farm type of person. Could be because I grew up in a rural area. Roz at Drunkencows.com has the best cow paintings. This is my favorite one. Love them! 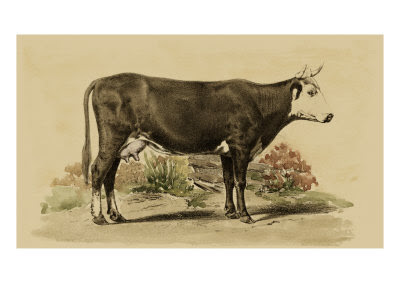 I have a collection of antique bovine paintings myself!! My husband just painted a cow canvas for our living room for me. Stop by and check it out! Have you seen any vintage prints of these? Have loved them forever! I just can't find the perfect one for me...painted or breathing!